My most recent painting from the In Our Veins series has found a new home. 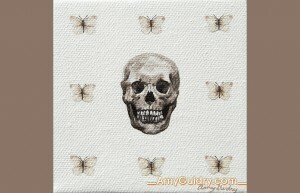 Circuition is an acrylic on canvas, 4″ x 4″ and was featured in yesterday’s newsletter. Circuition refers to the life cycle. The butterflies represent life- both are beautiful, fragile, and ephemeral. View the painting online here: http://amyguidry.com/circuition.html.